Pas-Caart van Guinea en de Custen daer aen gelegen Van Cabo verde tot Cabo de Bona Esperanca - Goos, P.
Title : Pas-Caart van Guinea en de Custen daer aen gelegen Van Cabo verde tot Cabo de Bona Esperanca. Size : 21.5 x 17.4 inches. / 54.5 x 44.2 cm. 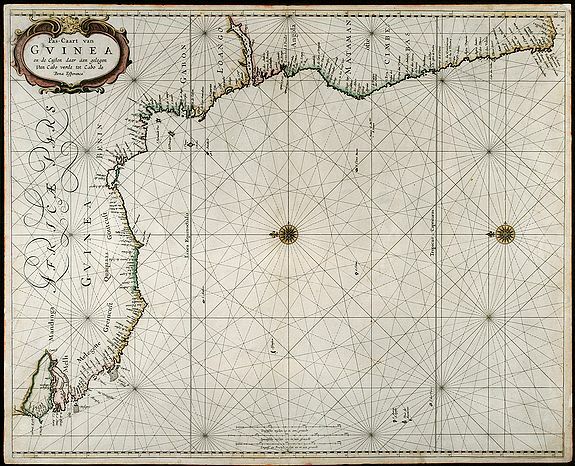 Description :Beautiful seachart of the southwest coast of Africa by P. Goos from the famous sea atlas "De Zee-Atlas ofte Water-Weereld". Showing the coatlines of Guinea, Sierra Leone, Liberia, Ivory Coast via Namibia down to Cape Town. Condition : Some small tears in margin backed. Very good condition.